Metal roofs are a lot less work than other kinds of roofs when it comes to maintenance, and can provide your home with protection for generations if taken care of properly. All metal roofs will come with a protective coating; however, this coating may not last very long. Therefore, the first and best step you will ever make in protective maintenance of your metal roof is to cover it with a new, reliable protective coating. Several different choices of metal EPDM coating are available and they include polymeric and asphalt coatings. Most metal roofs are constructed using long metal sheets or with metal tiles. It doesn’t matter what kind of material is used on your roof, there is going to be a danger that, at every intersection where the tiles or sheets are overlapped, leaks can occur. Metal roofs will usually wear fastest around the ridge and valley of the roof, as well as around the fascia board. This can be avoided with proper maintenance. The majority of metal roofs are protected by being either aluminized or galvanized, or else they are painted with galvalume protective coating. Each of these materials is pretty much maintenance free, although regular cleaning is a necessity. However, it is better to add your own, high-performance protective coating if you want true piece of mind. Out of all the different protective metal roof paints available, perhaps one of the best ones is Polyyinylidene Fluoride or PVDF. PVDF can increase the strength of the metal on your roof, it is resistant to chemicals and corrosive substances, it offers the highest weather resistance, protection from UV rays and it is even resistant to fungi. When you apply a PVDF treatment to your metal roof, you should only need to check it every 9 or 10 years to see if a new coat is required, while other metal roof finishes such as plastisol, acrylic and urethane will need checking after just 3 to 5 years. There are many great and innovative new solutions for metal roof sealing. Traditionally used ashphaultic sealants have been outperformed when compared to newer products such as the micro sealant called EternaBond. This new product comes as a large roll of sticky tape and can be applied easily by anyone, even somebody with no experience. The EternaBond tape offers great resistance to temperature extremes and inclement weather, and it’s a good fix for leakages too. However, it’s worthwhile to know that while a sealant such as this is great for patch up jobs, employing preventative measures such as a EPDM roof coatings means that it’s unlikely you will ever need to use a sealant. Before undertaking any maintenance we recommend that you consult a roofing expert about all the safety precautions you should take before climbing onto the roof. Do not allow different kinds of metal to be touching one another. When different metals touch, chemical reactions can occur and cause the metal to corrode. Be vigilant and make sure the paintwork is always touched up. This will help to prevent rust. As soon as you spot a hole or an open seam, repair it immediately, do not delay! Smaller holes can be covered with either roofing cement, or else the EternaBond tape that was discussed previously. Large holes need to be patched and soldered into place with the same kind of metal as the roof is made from. Any screws that you use must be of the same kind of metal as the roof. When screwing plates or sheets into place, make sure you always use a washer, and install the screw into a raised area rather than low areas as this can lead to water pooling and eventual leaks. Use only non-corrosive metal flux with steel roofs. For copper roofs, acid flux is best. Firstly, clean the area around the hole thoroughly, washing away all dust. Cut a good sized piece of galvanized metal that covers the hole easily. You should have a bearing of 2 or 3 inches over the edge of the hole. Tape the galvanized metal sheet into place with the butyl tape. Screw the sheet into the roof, spacing the screws out every 2-3 inches. Seal the edges of the sheet and around the screws with caulk. Finally, cover the new patch with PVDF roof coating. A roof leak can not only be troublesome, it can be costly. Both the damage done by the leaking water itself and the cost of repairing the roof can quickly add up. Rather than spend a lot of time, money and effort hiring professionals to repair your roof why not do it yourself with the only product that’s easy to use, cost efficient and extremely durable? There’s no reason to endure lengthy and costly repairs when you can use liquid EPDM to cover your roof and prevent leaking, cracking and other damage from the elements. Constructed using the same chemical composition as traditional sheet EPDM Coating, liquid EPDM gives you the added bonus of flexibility and ease of use so you can handle those repairs yourself. While traditional sheet EPDM can trap air underneath, leading to cracking and breaking later on, liquid EPDM goes on in one smooth coat and is designed to expel excess air during the curing process so that you are left with a strong, water and airtight seal. And because liquid EPDM will expand and contract with the roof’s surface when the temperature changes, there is less likelihood of weather related damage resulting in a roof leak. Anyone who has ever had to undergo roof repairs knows how stressful that can be. Normally, it involves calling in professionals and having them use bulky materials for repairs that only add extra weight to your roof. Liquid EPDM can be applied by almost anyone and goes on in one smooth and easy coat so your roof is not bearing any excess weight. The flexibility of liquid EPDM allows it to be applied to almost any type of roof, from commercial and residential to RV’s, trailers and boats. It can be quickly and easily molded to fit any surface and within hours it will cure to form a watertight seal that can endure ponding water year round. Not only will liquid EPDM negate the need for professional repairs, because it can be applied in one coat, it also helps you to avoid the cost of applying multiple layers or using a primer. Again, this cuts down the cost of repairing a roof leak considerably. And the unique composition of EPDM Coatings is not only watertight, but will reduce both rain noise and heat build-up to keep you cooler and more comfortable. Liquid EPDM has been proven to outlast almost any other roofing substance. Acrylics, urethanes and other elastomers just don’t measure up. Nothing else provides the peace of mind and cost effectiveness of liquid EPDM. It’s the one stop solution for all roof repair needs, from industrial to residential and on surfaces ranging from concrete to metal. You want a dependable roof over your head, so don’t waste your time with messy and costly repairs. Use liquid EPDM and get it done right the first time with a secure seal that will last for years to come. 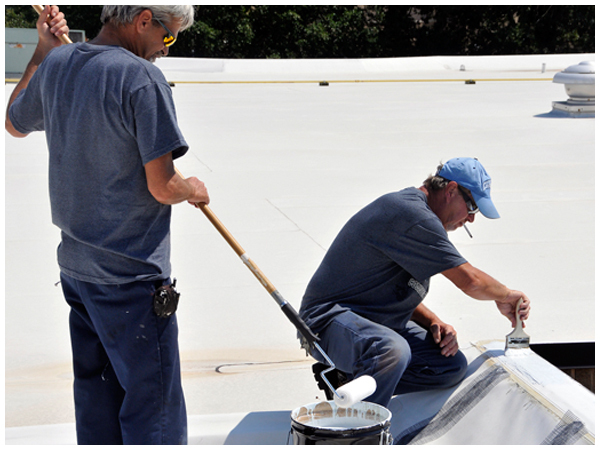 Consider liquid EPDM for your roofing needs and you won’t be disappointed!